I really can't remember a time when I wasn't fascinated by stones. When I was little, I would bring them home all the time; from the nearby beach, found near streams, even found on the field behind our house. Somewhat to my mother's chagrin, I would insist on taking stones home to Denmark from the various places we visited around the world when I was a child. She tried-- to the best of her ability-- to get me to leave the stones behind and instead choose more "sensible" souvenirs like postcards or tiny stuffed animals. Generally, it was to little avail... although it feels (at least to me) like we left behind hundreds of "perfectly good" stones, around the world. Experience has taught me that there are "Stone People" in this world of ours. Sure, lots of people "like" stones, but Stone People seem to have a deeper relationship with the rocks they find... almost like they "communicate" with them, on some metaphysical level. I would have to include myself in the Tribe of the Stone People. 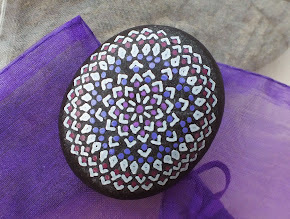 The idea of painting or decorating stones is not new to me. Many years ago, I would paint runes on matched sets of stones and given them to people as "divination sets." I previously considered painting stones-- in the decorative sense-- but chose not to, because I was "stuck" with the idea that I needed to be able to paint realistic "seascapes" or birds... and I don't have "that kind" of artistic aptitude.